Ariana Grande, super-successful singer and actress, appears to have slid out of two-year relationship last month straight into an engagement to actor and comedian Pete Davidson with a major sparkler on her finger to mark the moment. Her music videos have been viewed more than 10 billion times. 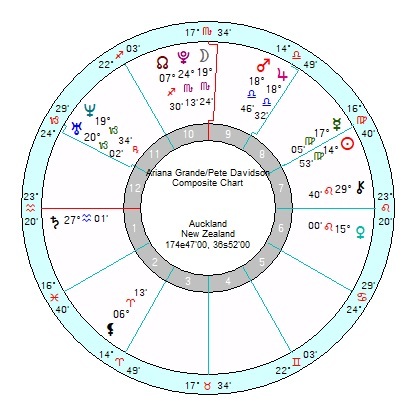 Ariana, born 26 June 1993 9.25pm Boca Raton, Florida, has a 6th house, hard-working Cancer Sun trine Saturn in Pisces and square Moon Jupiter in Libra so she’ll be constantly dancing between her heart and her head, one moment enthusiastic, the next moment sombre. She has a controlling and influential 10th house Pluto, a deeply buried Mars in her 8th and a highly-strung Uranus Neptune in Capricorn on her Ascendant. A complicated lady who walks her own road and likes her own way. Pete Davidson, 16 November 1993 New York, has a Sun Pluto conjunction in Scorpio square Saturn in Aquarius; with Venus Mercury Jupiter also conjunct in Scorpio, so he is very intense, tough-minded but probably prone to depression. His Moon is late Sagittarius or early Capricorn. He suffers from Crohn’s disease which in the past he treated with medical marijuana as a pain reliever and has recently also admitted to borderline personality disorder. He’s had a rough road to walk and isn’t exactly a lightweight personality either. His charming Jupiter, Mercury, Venus in Scorpio are conjunct her midheaven, so career and status will be priorities. But his Sun Pluto is also conjunct her Pluto which could end up in a tussle for control. 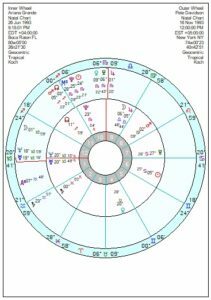 Their relationship chart has a composite, highly-changeable Sun Mercury trine Neptune Uranus; with Neptune Uranus square an adventurous Mars Jupiter. Mars Jupiter often appears in the seemed-a-good-idea-at-the-time kind of relationships. There may be a possessive and emotionally intense composite Moon Pluto square Venus for a sparkle of passion; and with Pluto square Saturn it will be fairly chained-together for a while. It’ll have a rocky rise ahead with tr Neptune opposing the composite Sun this year and Mercury next; with a disruptive and confusing tr Pluto conjunct Neptune Uranus till late 2019. I have a bad feeling about it as his mental health is extremely fragile. Whichever way it goes, it ain’t going to end well.